Pneumonia caused by bacteria tends to be the most serious kind. In adults, bacteria are the most common cause of pneumonia. The most common pneumonia-causing germ in adults is Streptococcus pneumoniae (pneumococcus). Atypical pneumonia, often called walking pneumonia, is caused by certain other bacteria. 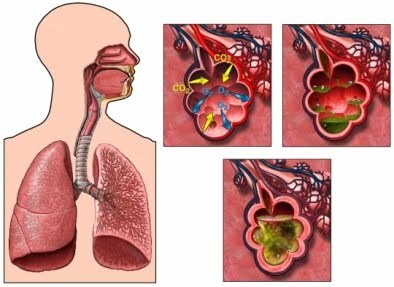 Pneumocystis jiroveci pneumonia is sometimes seen in people whose immune system is not working well. Many other bacteria can also cause pneumonia. Viruses are also a common cause of pneumonia, especially in infants and young children. Shaking and "teeth-chattering" chills. You may have this only one time or many times. Pathogenesis of pneumonia include interactions between microorganisms (MO) causes that go through various avenues, with patient endurance. Germs reach the alveoli by inhalation, aspiration of oropharyngeal bacteria, hematogenous spread from another focus of infection, or direct spread from the site of infection. At the lower respiratory tract, the bacteria encounter in the form of immune defense system mukosilier, cellular resistance alveolar macrophages, bronchial lymphocytes and neutrophils. Also humoral immune IgA and IgG from bronchial secretions. The occurrence of pneumonia depends on the virulence of MO, the ease and extent of endurance. Dyspnoea, bronchial breath sounds, crackles. Photos chest: there are patches lobe infiltrates. Tachypnea / rapid breathing, shallow accompanied nostrils. Bronchial breath sounds, crackles wet, accessory muscle use. R :/ takipneu, shallow breathing, and asymmetrical chest movements often occur because of discomfort or movement of the chest wall and lung fluid. R :/ Breath in facilitating the maximum expansion of the lung / airway smaller. Coughing is a natural cleaning mechanism of airway / help the cilia to maintain a patent airway. Emphasis lower chest discomfort and breathing effort seating position allows deeper and more powerful. R :/ Stimulate cough or mechanical airway clearance in patients who are unable to perform because of ineffective cough or a decreased level of consciousness. Give fluids at least 2500 ml / day (unless contraindicated). Offer warm water rather than cold. R :/ liquids (especially warm) mobilize and remove secretions. Assist to monitor the effects of treatment and physiotherapy another nebuliser. For example, an incentive spirometer, blowing bottles, percussion, postural drainage. Take action in between meals and limit fluids when possible. R :/ Facilitate dilution and removal of secretions. Postural drainage is not effective in causing interstitial pneumonia or alveolar exudate or damage. Coordination of treatment / schedule and oral input vomit degrade because of cough, sputum spending. R :/ equipment for lowering the mobilization of secretions bronchospasm. Analgesics are given to improve the cough by decreasing discomfort but should be used with caution, because it can reduce the effort cough / depress respiration.